Great location and very spacious apartment. Accommodating staff. 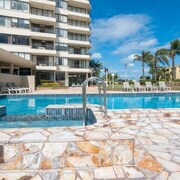 Great location near beach Good holiday spot, clean, and great pool. The couch in room was very uncomfortable with the cushions moving all the time, a little valcro would fix this. Pillows were also flat and lifeless. Overall expiernce was good. Would stay again. Stayed in rm 78 which was north facing with a great view of the beaches north. Property needs the decor updating. Had a lot of cooking equipment and storage containers. need some maintenance done to it. Close to beach, shops and restaurants. Great spot! Had a wonderful family getaway. 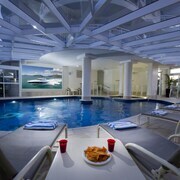 Kids loved the inside heated pool and the two spas. Great distance to beach, shops and restaurants. Had an excellent view too. Great hotel, great beach As a family of 5 we had a beautiful room with great views of the beach. Very comfortable apartment with great facilities, the kids loved the putt putt course, the pool & spa. Rooms were super clean with all the mod cons needed for a comfortable and relaxing stay. Beautiful appartments From the text message offering early check in to the spaciousness and cleanliness of the appartments - all excellent. Great location and views, lovely refurbishment and personalised service. Keep up the great work. We will definitely be back. Great Location Great location opposite Miami beech and close to shops and main transport routes. 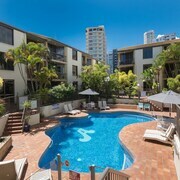 Great for families who want to be away from the main Surfers Paradise area. Had enough of hearing about ROIs and KPIs when you'd rather be putting your feet up somewhere with a couple of G&Ts? Ditch the office (and all that tiring jargon) and book a hotel in Burleigh Heads. You’ll find it 8 kilometres from central Gold Coast. There is no such thing as being bored in Gold Coast. Tick off bucket list-worthy sights like Sea World, Dreamworld and Warner Bros. Movie World and make sure you humblebrag to everyone back at home afterwards. Hike through Burleigh Head National Park, where the environment of native plants and animals is being preserved for future generations. After a mad day of sightseeing, you won't need to venture far to find a place to crash. 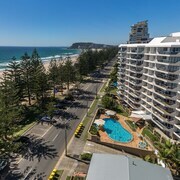 The Burleigh Surf Apartments and Gemini Court Holiday Apartments are two tempting options to consider nearby. Recharge your soul when you spend the afternoon at Burleigh Beach. Bring some friends, and bask in the sun! You can throw down your suitcase and bed down at the Miami Beachside Holiday Apartments and Grande Florida Beachside Resort if you plan to visit this attraction. 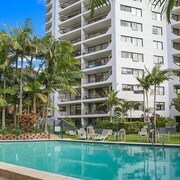 Want a room in Burleigh Heads but don't want to burn a hole in your wallet? Have a look at the bodacious deals at the Burleigh Beach Tourist Park. You'll want to get in quick though, as there are only a few budget accommodations here. What are getaways for if not splurging? 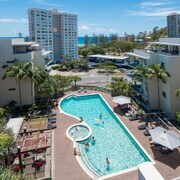 The Indigo Blue Beachfront Apartments and Bujerum Apartments on Burleigh are our top picks for those who aren't afraid of spending a little extra cash. Keen to check out the local café culture? Catch up on your travel blog, order a hot coffee and spoil yourself with some sweet treats at Studio Surf Shop. Trust us, you're gonna need some decent food after all that sightseeing. Luckily, Thai Puntip has a delicious menu which will really put a lining on your tummy! You could be sensible and go back to the hotel, but you're on holiday, right? Regardless, there's a beer with your name on it at Lockwood Bar! How about booking a room in Miami or Nobby Beach when arranging your getaway? 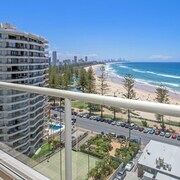 Miami is only 2 kilometres from Burleigh Heads, and Nobby Beach is approximately 3 kilometres away. Epic sunsets and breathtaking adventures — stop living through your mates' travel feeds! With some help from lastminute.com.au, you'll be having your own #TravelEnvy experiences before you know it!